This Line Angle guide will allow you to draw perfectly straight lines, on the Guide itself or parallel to it. 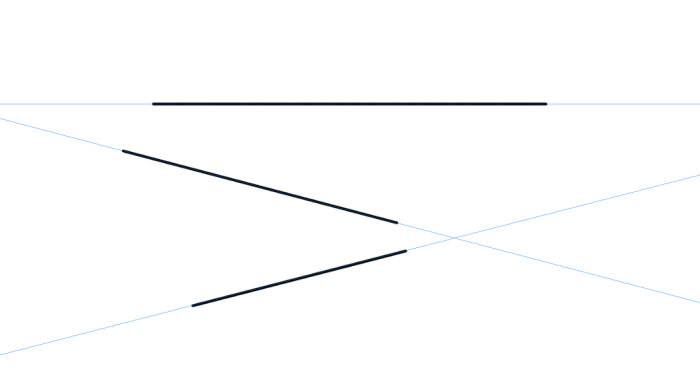 Start by drawing a "virtual" line (by default, in blue) in your drawing area. As long as you are not releasing the cursor, you can give it the angle you want. A small square shows you the position of the cursor. You will notice that the cursor is the point around which the virtual line will turn. Once satisfied, release the cursor. The Line Angle guide is created. You will then have access to all of its option in the Guidelines panel. With an eye and a magnet, you only need to deactivate the eye to deactivate the two functions. the icon is crossed when the option is deactivated. This Assist will help you to draw perfect lines, in parallel of the virtual one you created. A smaller virtual line will appear where the cursor is. You will not be able to deviate from this Assist guide. You can change the color of these virtual lines by clicking on the blue (by default) square next to Transparency to obtain a picker. You will then be able to pick another color in the Color Panel or in the software's interface. If you collapse the Guides parameters with the +/- icon, you will notice that the eye ( ) is blue. If you change the Color of these virtual lines, you will notice that the eye will not be blue, but the new color you have chosen. The adjacent value (50% by default) allows you to change the opacity of these lines. The Margin function (16 by default) will magnetize your cursor to 16 pixels near your Line angle guide. You can change this value with the mini-elevator on the right or with the numeric field. 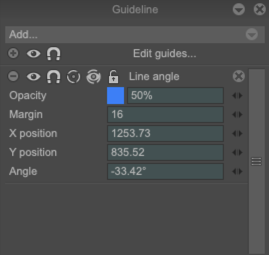 If you draw without the Assistance, you will follow the Line Angle guide close to 16 pixels. If you deviate just a little bit from this margin, your line will no longer be perfectly parallel. The X Position, Y Position and Angle indicate the position of your Line Angle guide. You can also modify these parameters with the mini-elevators on the right or the numeric fields. You can also use the Edit button. You will be able to access the little blue square once again to manually modify your Line angle guide. You can obviously add as many Line angle guides as you wish. The little cross on the right ( ) will close the Guide but also destroy it. There will be no way to retrieve this Guide. By double-clicking on the Line Angle, you will be able to rename your Guide. Press Enter to confirm the new name and leave the alphanumeric field. This action is doable on each Guide.